This video can act as a motivational excerpt to prompt students to ask questions. The video collection from this source is reliable and reputable. Comments from expert scientist: This video provides scientifically accurate information regarding Arctic climate change and how it interacts with global climate change. It provides interesting and useful visual aids regarding the sea ice albedo feedback while relating to people that may be less interested in science with animals. It also has the seal of NOAA, a government agency. 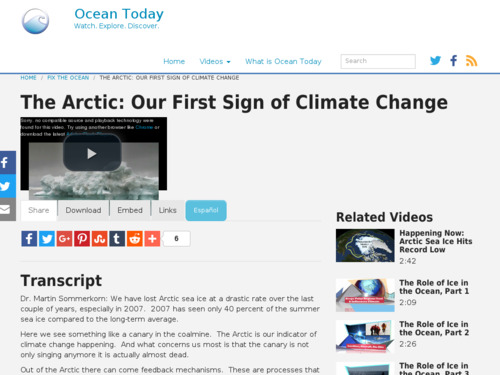 The videos on this site are limited in length and therefore may be best used as introductory material to a unit on climate change. Technical quality good with hearing-impaired text running across the bottom.